FRANCE: Floating foundation specialist Ideol and substation expert STX Offshore have announced a joint development project to design a floating substation. 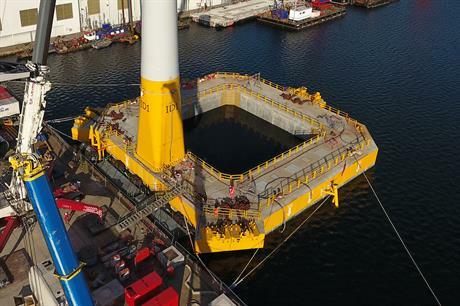 Ideol said the design would include its dampening pool solution featured on its Floatgen turbine foundation — the prototype of which was recently installed off France. The programme follows on from STX's work unveiled in June 2017 for a modular-based substation. STX's SeeOs (scalable, efficient, evolutive offshore station) was based on a standard 200-300MW module with all the features necessary to meet 90% of cases, STX said. Two or three modules can then be joined together to meet power requirements up to 900MW, and various features added, such as shunt reactors, back-up generators, accommodation units and workshops. The project partners are aiming for the new modular floating substation to be market-ready "for France's upcoming floating commercial tenders". "This project pushes the boundaries of the offshore wind market as offshore substations are a crucial component of a commercial array," said Ideol CEO Paul de la Guérivière. Frédéric Gizaud, STX business unit director, added: "We believe in its competitiveness and in our contribution to lower LCOE that will make this new market a reality."